A little play on Dylan’s Highway 61 Revisited, lol. NWT Highway 3 connects Yellowknife to The south (connecting to NWT Highway 1 near Fort Providence). Yesterday, Dale, Jenna and I went for a drive on Highway 3. We just wanted to get out for a quick drive to see want things we could see. We followed along the highway until reaching the Stagg River. 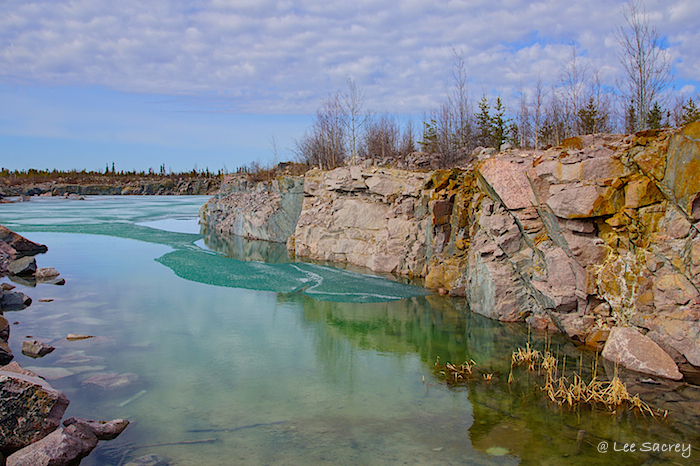 From there we headed back to Yellowknife, making a few stops to snap some photos along our way home. 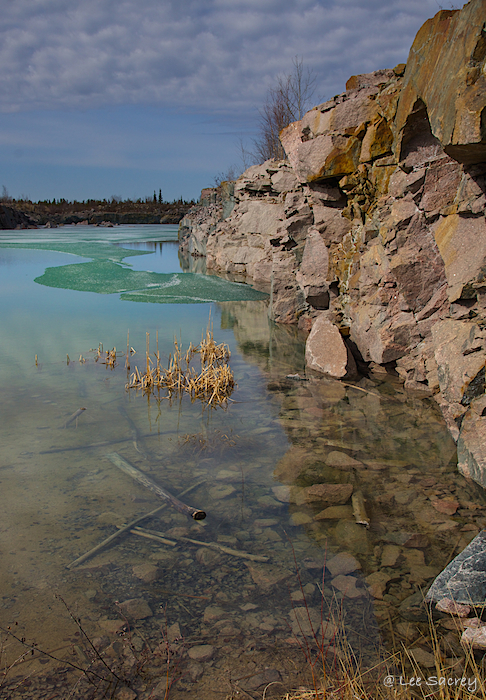 There were two main places of interest, a pond created by a gravel pit that had beautiful glacier coloured water and the second was a small pond with red and yellow moss and foliage all around with a beautiful sky above. I took several versions of the second and will post each here and you can choose which you like. Jenna wanted to shoot as well and she decided my Maxxum 7 35mm film camera would work nicely for her. I captured a shot of her using it. It was a great way to kill and afternoon but, once we arrived home Jenna made it clear that she want to go out and spend some more time driving and shooting. So, Jenna and I decided we would load a few items in the truck, head out again and stay the night. We headed out again and continued to Mosquito Creek just past Becho’ko. We pulled off the Highway and went all the way down to the creek. There we watched a movie, ate and just hung out. This morning we were up early to see if we could find any wildlife. It was a great night and some great time spent with Jenna. 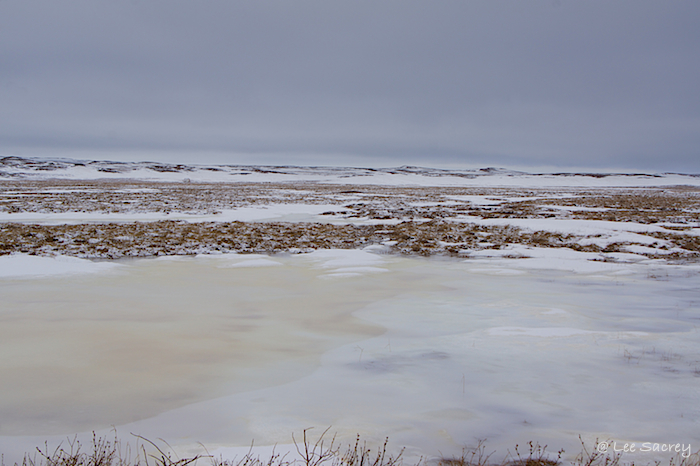 We saw lots of ducks, a sandhill crane and three snowshoe hare before making our way back to town. Here is what we saw yesterday and this morning. Enjoy, thanks for hunting out and as always Happy Shooting. Ok, all you Sir John Franklin High School students don’t get excited, lol. 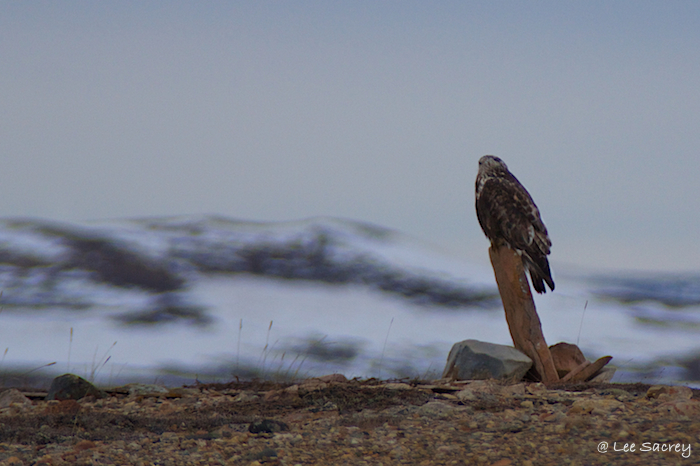 This is the last post of my recent Paulatuk trip (at least I think it is, it may be the Eagles last tour, lol). 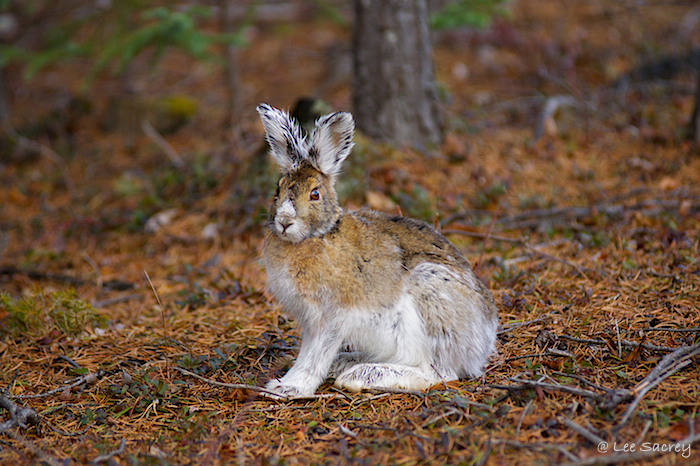 On previous visits I have photographed, Sic-Sics, a Bluenose-West Caribou, 5 different grizzly bears and a few other critters. Well this time I was able to capture something I don’t believe I have seen before. This time I captured a Dark Morph coloured Gyrfalcon! He/She is amazing, a killing machine as far as birds of prey go (as I was told by someone smarter than I). I am trying to convince some friends of mine that I am not a true bird watcher/photographer. For the most part I believe that, I don’t go out looking for some strange bird that was spotted around town. I have gone out with others while they look and if I am out and see birds I generally stop and try to get some images of them. I don’t often go for the sole purpose of seeing a bird that I have never seen. What I am finding though, is that when I see different birds I think of my friends who would want to be there or I wonder what bird it is and if they could tell me about it. That seems to get me out on occasion to capture these flyers. Sunday was one of those days. 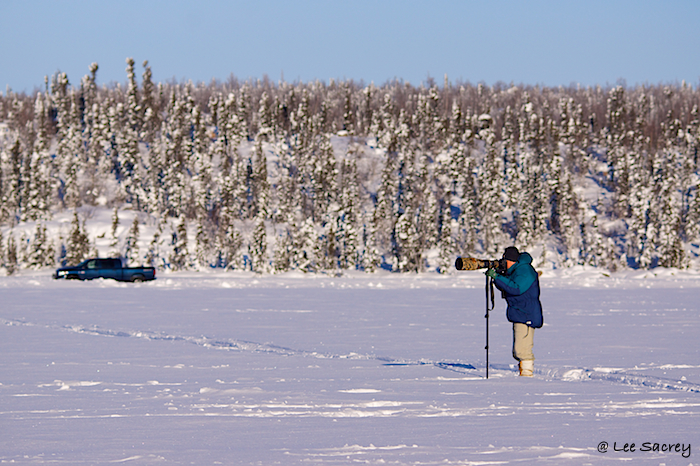 I was out taking some landscape images with my 35mm film camera and while driving back to the community of Paulatuk a bird flew past the truck just a few feet away. I didn’t get a good look but, it appear to be a hawk of some kind. I guessed it was a medium sized bird of prey and it was a medium grey colour. When I got back to the house I sent a message to my friend John McKay and asked if he could tell me what birds of prey there are in the Paulatuk area. He asked a few questions and gave me a small list of possibilities. I, and I guess John, was unsure as to what it could be. Not being able to give John more info so I could know what it was made me a little crazy. Later on Sunday I decided I would go back to the same area with hopes of seeing it again (like that normally works, lol). 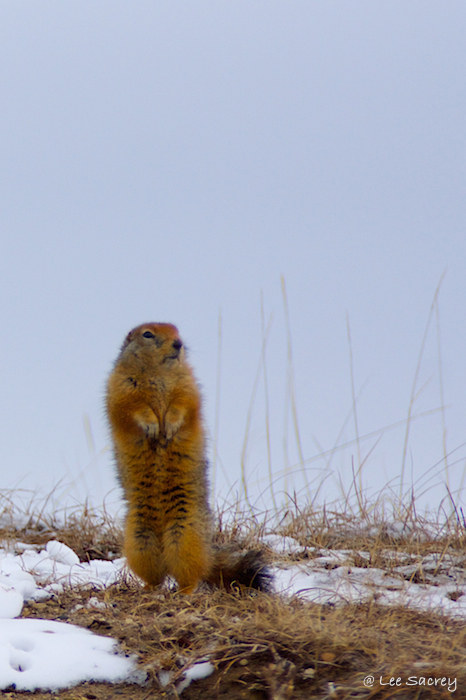 I didn’t have my 120-400mm lens with me but had my 70-200 and a 2x converter. I mounted those on my DSLR and off I went. I wasn’t expecting to see anything and was ready to switch back to my trusty landscape set up (I even brought my filters out with me). About 1/4 of the way to where I first saw this bird, I noticed something sitting on a large rock at the top of a hill. It was the bird, medium size, medium grey in colour – wow this birding stuff is easy, lol. Before I got close enough to get what I wanted it flew away. I watched its flight path and continued. This went on for about 20 minutes. The bird would land and fly before I would get a shot. After the 20 minutes I lost sight of this beautiful creature. I continued to drive around for another 30 minutes and saw nothing. I decided to head back. Coming from the opposite direction I could see the rock on the hill in the distance about 1.5 kilometres away. There was something on it, but it wasn’t my new friend. This thing was bigger and darker in colour. Not wanting it to just fly off, I slowed and just crept along. I noticed to my right, in the valley, a person driving along the Hornaday water shed on an ATV (the water is still in Paulatuk FYI). 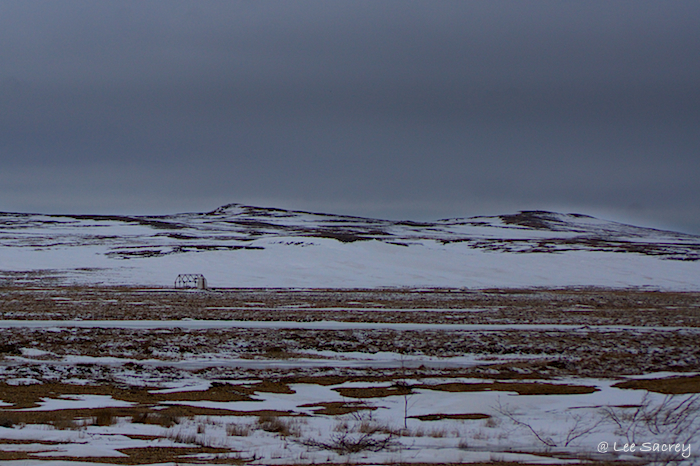 It looked so small in the vastness of the landscape. I am amazed that I get to visit these extraordinary locations. All of a sudden I noticed something else. Directly between me and the far off ATV was my medium grey bird friend, almost hidden from view in the texture and colour of the ground. I grabbed the camera and snapped away. Gotcha! With in a couple of seconds of me getting out to get a closer view it was gone. I looked back to the rock on the hill and that new bird friend was still there. I continued to move closer and this one isn’t as easily stirred. I drove about 100 ft and was now on the opposite side (in the truck) from where the dark coloured bird was. I quietly opened the door and exited. As I did this, the bird began to move and started to fly. I was sure I had lost my chance, but surprisingly it flew past me and perched about 80 ft away on the new rock. It was now directly in front of me. 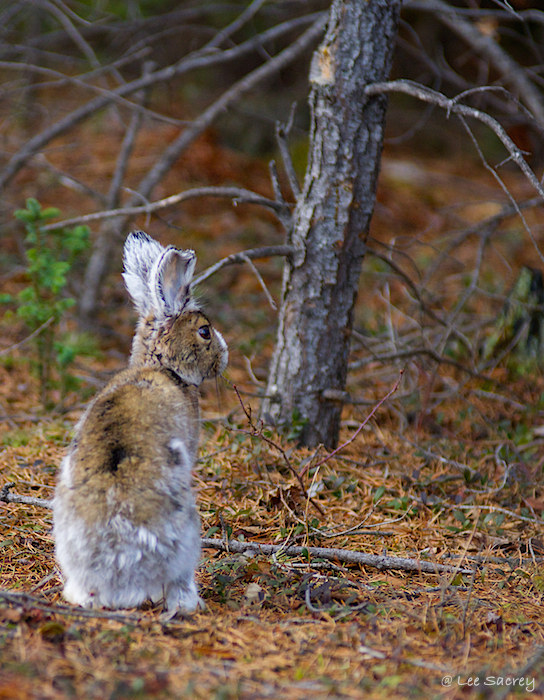 I got a couple of shots as quickly as I could and then moved forward slowly. I guess 80 ft was the limit as my new friend left very quickly and I couldn’t see it anywhere. I walked up to the rock to get a better look at the surrounding area, still nothing. My bird identifying shoot was over. 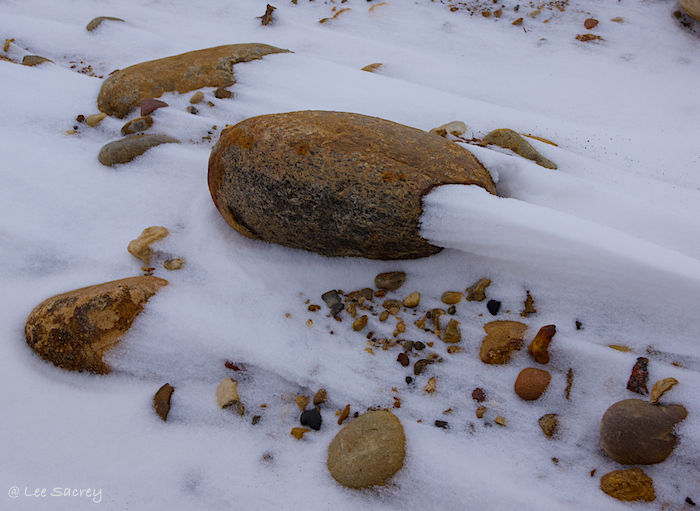 I headed back and sent John McKay some of the images. I thought the second darker bird may have been a juvenile of whatever kind of bird it was. The colour reminded me of a young bald eagle, but the size seemed wrong. I had no clue what it was. John, on the other hand, is like the all-knowing Bird Whisperer. Within minutes I had the info I wanted. The medium grey bird is a Peregrine Falcon, the second, larger, darker bird is a Dark Morph coloured Gyrfalcon. The Gyrfalcon, by my estimate, was 15 – 17 inches tall (sorry I am Canadian so 38 – 43 cm) and the Peregrine about 12 inches or 30 cm. So there you have it, my most resent bird capture and as you can tell I am no birder, I was not a character in “The Big Year”. Here is a shot of the Gyrfalcon. Enjoy, thanks for visiting and as always, Happy Shooting. This is the last night of this trip to Paulatuk and while I sit here writing, I am assuming that most, if not all, of you readers have never been here. 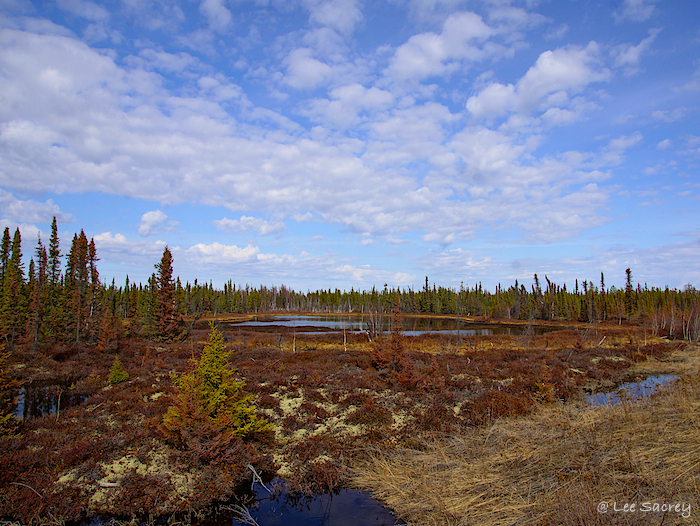 I have blogged about Paulatuk several times (three time in the last three nights) so, it may give some of you a little familiarity with the community but nothing I say or show can give a view of the area as well as being here. Tonight, I thought I would display several images of the same subject (one item in the landscape) to try to give you an idea of the scale of the area around Paulatuk. To show just how big the Canadian Arctic can be. About a kilometre from the community is the frame-work of someone’s old camp building. It has been there in the same place since I have been traveling here and it has always interested me. 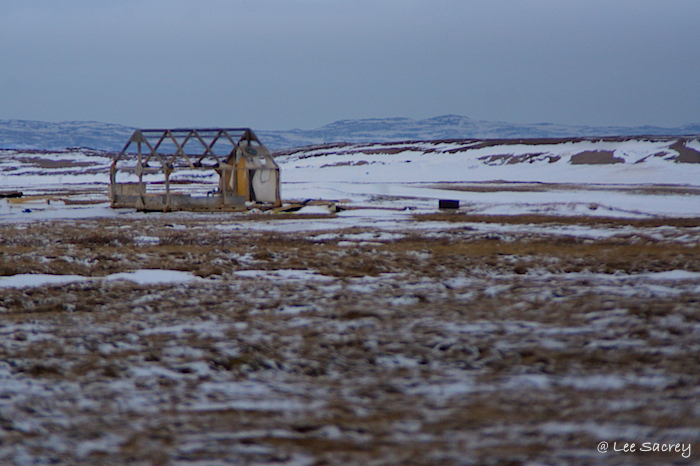 Yesterday, while I traveled around, I took several photos of the old camp frame. I used a variety of focal lengths to portray a number of different views of the landscape around this small old building. In a couple of them you may need to search for the wooden structure as it will be very small. When I am out snapping photographs of this part of the north I love how it makes me feel so small and at times I like how alone I feel while standing with nothing but Canadian wilderness around me. No buildings, no cars, no crowds of people, the business of normal everyday life is gone. It is quiet and very relaxing to me. I think I need to just hike here for a week or so, no phones, no internet, just fresh clean air and wide open spaces. My wife and girls are laughing right now at the thought of me going crazy without the internet, lol. I could do it ladies! Anyway enough talking, here is how wide open the Canadian Arctic can be. If you want to come experience it for yourself everyone here will welcome you and heck I will come with you. Here is a sample of what you can see and feel, enjoy, thanks for popping in and as always Happy Shooting. This morning I was up and had planned a photo shoot for myself just as I did yesterday. I guess I should explain why I seem to have this free time on a work trip to Paulatuk. Well, I am here often as I stated previously and usually go shooting after work is complete. For this trip I planned a few extra days for two reasons; the first is to have some time available to help a couple of people in Paulatuk with some finance issues/needs. I didn’t want to pressure any of them into having me do their work but, I made sure they knew I was available if they chose to want some assistance. 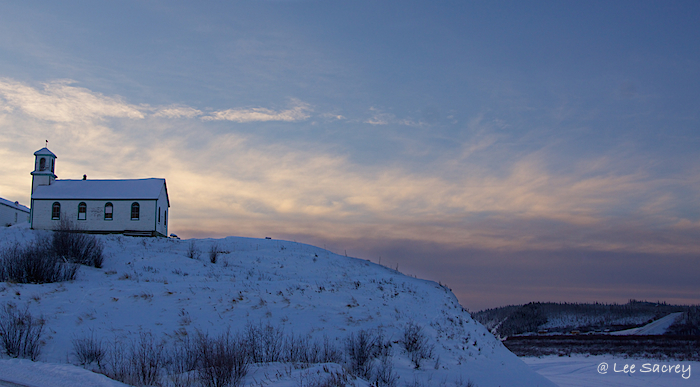 The second is that I wanted some time to just be in Paulatuk, to hang out, to take in the area to be part of the Hamlet for a few days and of course to photograph. So far my weekend in Paulatuk has been great. I had two mornings of shooting the area and lots of time to do some photo editing and to create these blog posts. A few months ago I took some engagement photos for a couple I know here and before I leave they will have all those images and will no longer have to wait for my crazy schedule to slow for them to get their photos. It has been quite overcast for the past few days but, as I write this the sun appears to be poking through the cloudy skies (which means I made need to go out and shoot again later). Today I wanted to capture some of the things I saw but didn’t capture yesterday, some of the birds that have returned, the Sic-Sic I saw in the afternoon and a few things around town. I was able to do that but, still missed some new things. 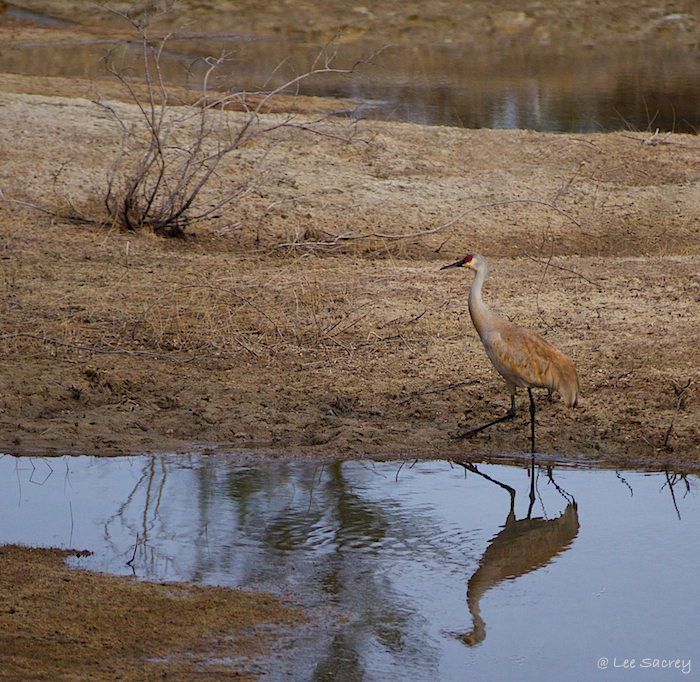 I spotted three Sandhill Cranes but, didn’t get any images of them, I watched a bird of prey (some type of hawk I believe) fly past and didn’t get a shot of it but, there were some things I did capture (see below). All in all I am enjoying my time here and I am already looking forward to my next visit. 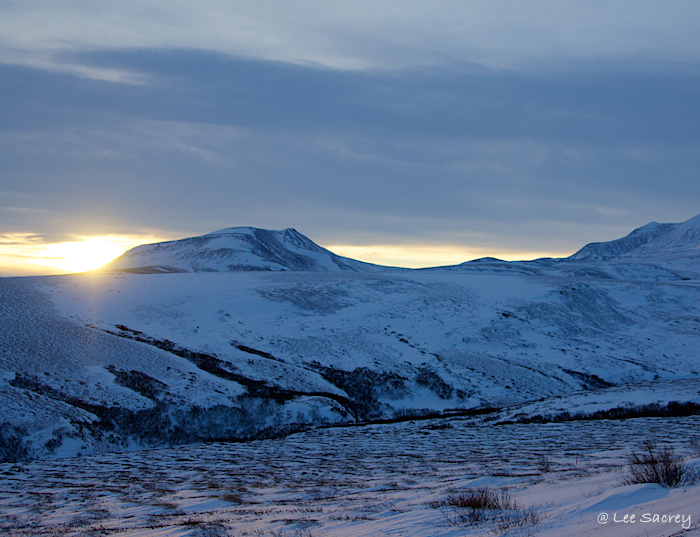 Here is what I saw this morning as I traveled in and around the Hamlet of Paulatuk. Enjoy, thanks for following along and as always, Happy Shooting. 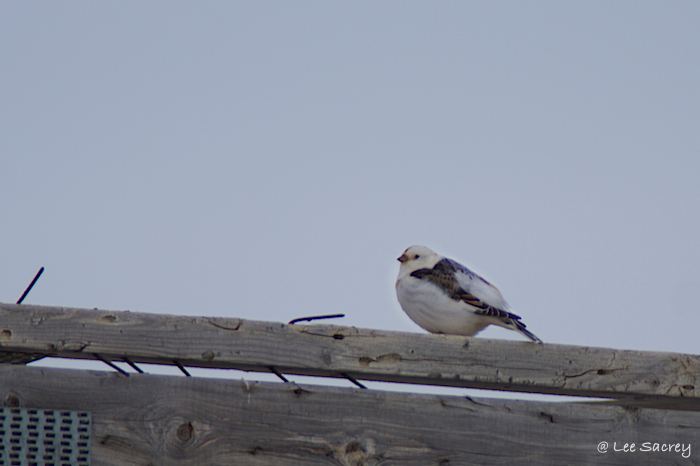 Finally a Snow Bunting that would stay still, lol. Beautiful even when it is a bad hair day. Funny, I haven’t seen any Caribou on this trip! Today I am in Paulatuk, NT. I am actually in Paulatuk quite often and I can tell as several locals welcomed me home as I stepped off Aklak Air’s Beechcraft 1900D. 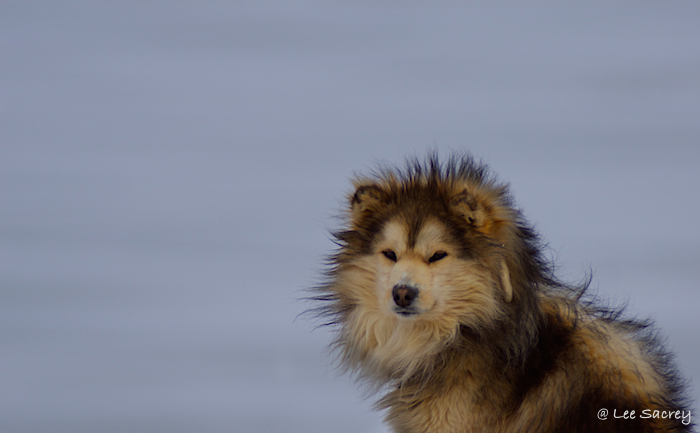 I like Paulatuk a lot and enjoy visiting here, it has a landscape that is uniquely northern and unlike anywhere else I have been. Also, Paulatuk is a Inuit Community and the fact that my Grandmother was an Inuit woman from Nain, Labrador gives me another connection to Paulatuk and the other communities in this area. My work brings me here and I am quite happy with that however, Paulatuk should be on the must visit list of every traveller, if it is for work or otherwise. Being one of the friendliest communities I visit is only one thing that should make you consider visiting, there are others. 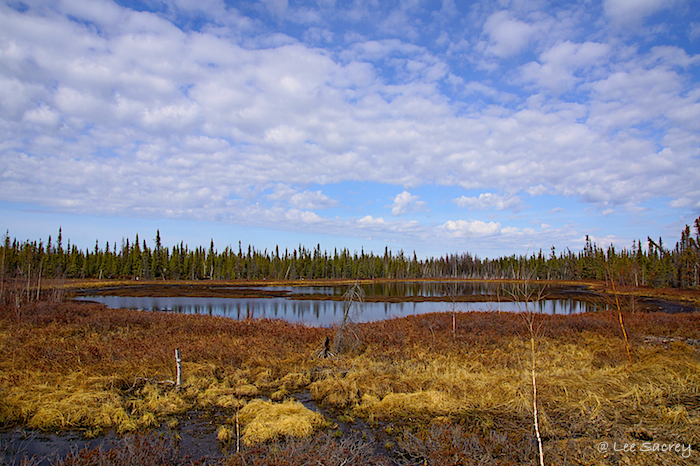 Paulatuk is the closest community to Tuktut Nogait National Park and the people here have a great connection to the park and the history of the land here. I haven’t been to the park yet but, when I do get there (and I will get there) I feel having connected with the community will add to my future park experience. The Brock and Hornaday Rivers run in the park, the Brock River Canyon have been described to me as the Grand Canyon of the Canadian North, and the Hornaday River has unique features and La Roncière Falls. 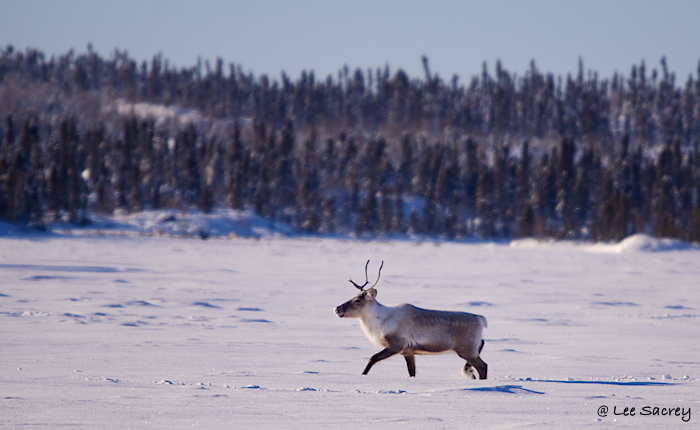 Tuktut Nogait means “Young Caribou” and the area is home to the Bluenose-West Caribou herd. 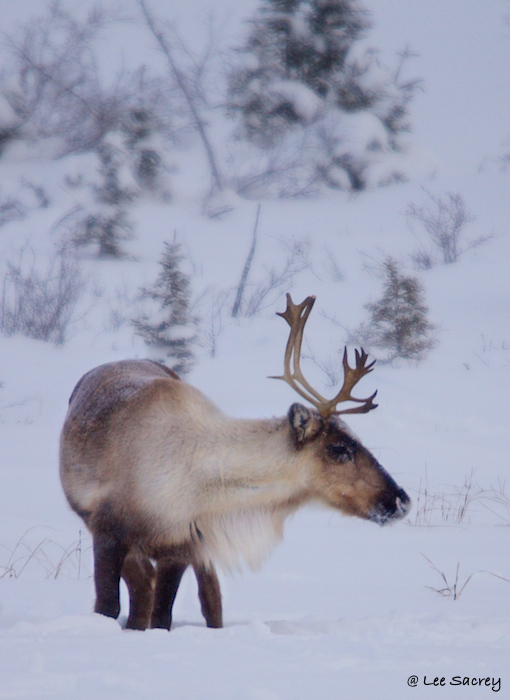 I photographed a beautiful Caribou buck during a pervious trip to Paulatuk. 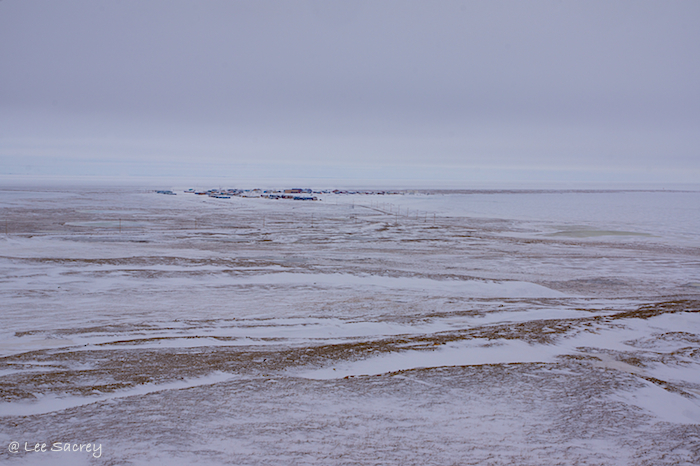 Paulatuk is also near the Smoking Hills (about 65 miles from the community). The Smoking Hills contain a hydrocarbon which have been burning for centuries and the smoke produced is what gives the hills their name. 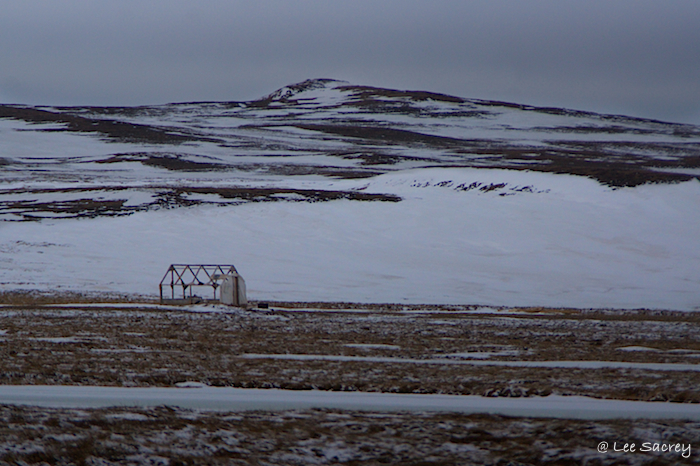 Also 59 miles to the northeast is the DEW line site of Cape Perry and some locals still visit the site there. Of course, The Paulatuk Moonlight Drummers and Dancer are from the community, if you don’t know who they are I suggest you go to youtube and check them out. There is a Hotel here in Paulatuk and a Northern Store for your needs and there is an abundance of local people to story tell or just say hello. Aklak Air has three scheduled flights a week here, if you want to visit make sure you check their schedule. 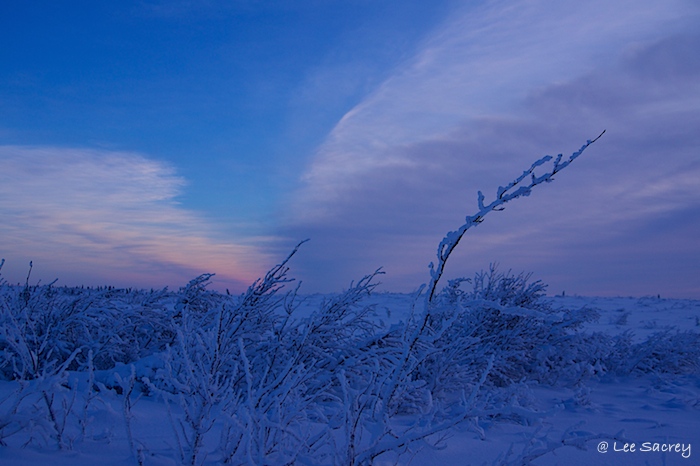 I decided to write this today due to an event in Yellowknife. 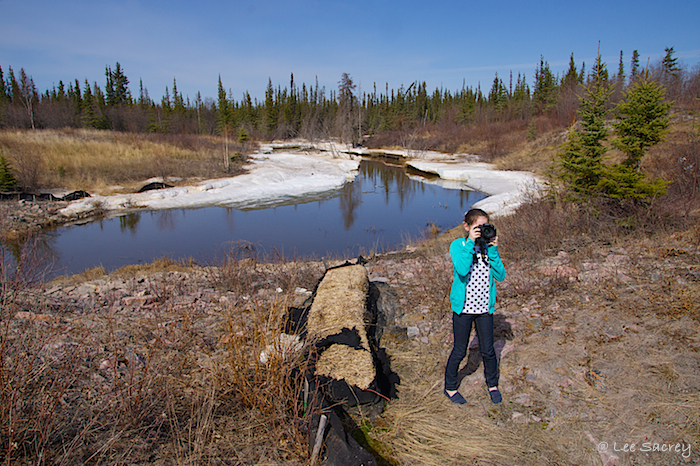 Samantha Stuart, a friend and fellow photographer, has organized a photo walk in Yellowknife. 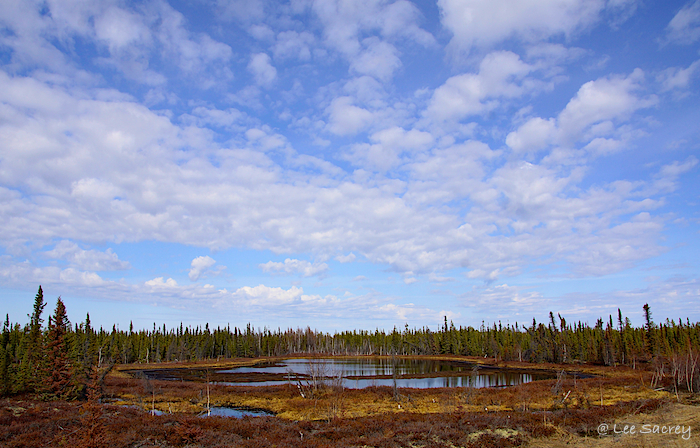 I can’t be there today so, I decided I would take to the area in and around Paulatuk to do a photo drive/walk of my own. 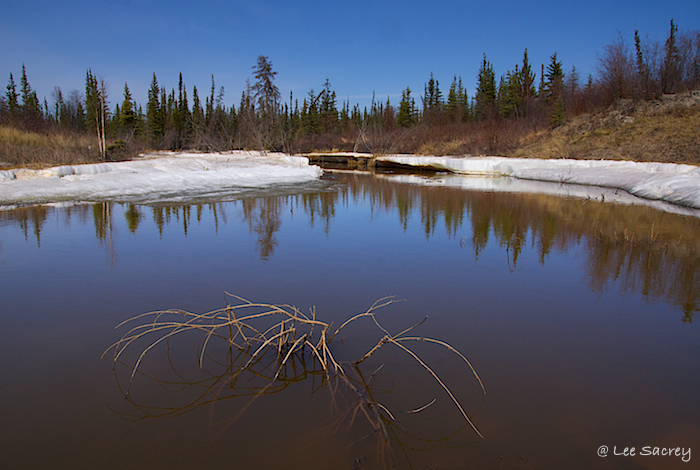 With a little fresh snow from last nights flurries Paulatuk spring won’t look like May in many southern communities but, I am glad I am here today to see this beautiful place and share some of what I see with the two or three people who might listen and read what I say, lol. Enjoy the images below and if you want to come see this area for yourself, let me know as I know I will be back maybe can join you and I know I can help with planning your visit. For now, thanks for stopping by and as always Happy Shooting. 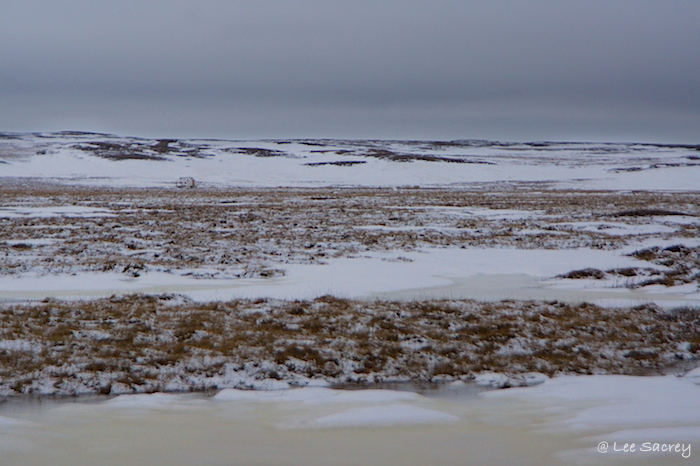 A couple of weekends after our first Caribou sighting and we stubble on the mother load. 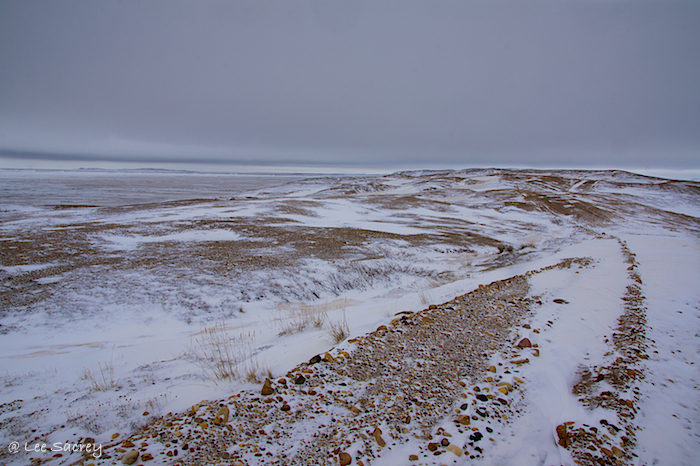 Traveling north on the Ice Road we get to Brown Lake, at first we see nothing and continue north. It didn’t take much more than 10 or 15 minutes and we turn back and start heading home, we reach Brown Lake again and as we cross John notices something on the far side of the lake. More Caribou, a lot more. We stop grab our cameras and get ready to capture some images. 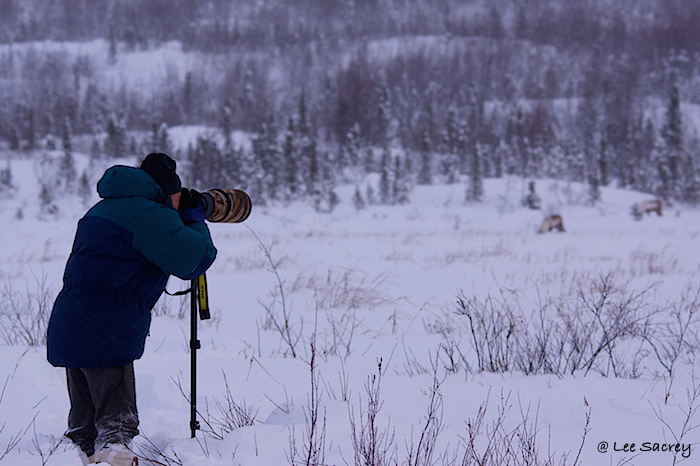 We haven’t figure out how we missed these Caribou when heading north, we estimate about 200 animals. How do you miss 200 Caribou? After we exit the truck, I would guess we walked a kilometre from the Ice Road, following a snowmobile trail across the lake close to where our new hoofed friends are. It always surprises me how seeing something you want to photograph get your juices following. John and I are on the lake unprotected from the wind and it had to be 20 to 25 minutes before we notice the temperature. I am also in awe of todays camera equipment. I never do anything special to protect my camera gear from the cold and I never really notice the difference in my battery life. I am sure the batteries rundown much quicker but, I don’t every remember it being an issue. This day on the Ice Road is no different, our gear is working just fine. Probably better than we are holding up. After what I would guess is 40 minutes we start walking back to the truck. The temperature is really noticeable now and it is cold. The truck is warm and I am again thinking of the lack of care I take when using my equipment in the cold. Neither John or I do anything to protect our cameras, we just open the doors and climb in laying our cameras on the seat and start to get ready to continue our drive back to YK. Heading south there is a lot of great conversation and some jokes at each others expense. This will remind John of that as I am sure at his age he has forgotten a time so far in the past, lol. Sorry John I couldn’t stop myself. Another great day on the winter road, maybe someone should do a reality show about the Ice Photographers or maybe next year I will mount an action camera to the truck and we will make our own show, lol. For now I guess my blog posts will have to do! Thanks for reading along and waiting for this second part of my Caribou posts. I hope you enjoyed it and as always Happy Shooting! 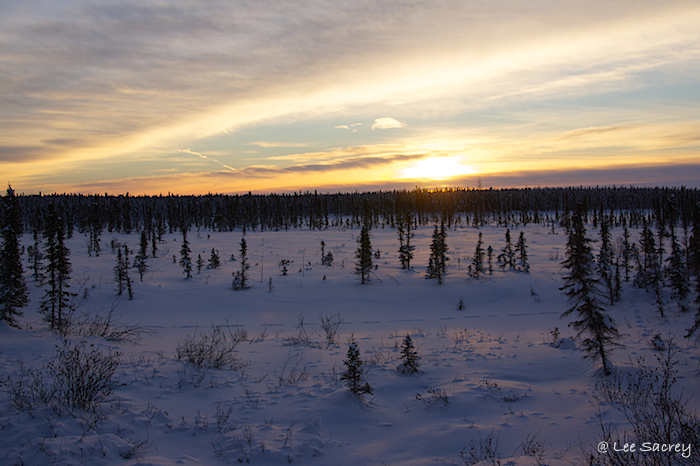 Between trips up the Winter Ice Road, I had to make a trip to Paulatuk for work. My flight connection required me to overnight in Inuvik and the next day the weather decided I should stay in Inuvik for a while, two days actually. On day two of our layover, my business partner and I decided to rent a truck and drive the Dempster Highway to the Yukon. I had never driven the Dempster before and just one day earlier it was closed due to weather conditions, this could get interesting. By lunch time we had our rental and some munchies and we were off. Our plan was to make it to the Yukon border and cross it before heading back. We knew we would stop in Fort McPherson for dinner on our return (my business partner has family there). We would make several stops to just take in our surroundings and I was snapping photos everywhere. 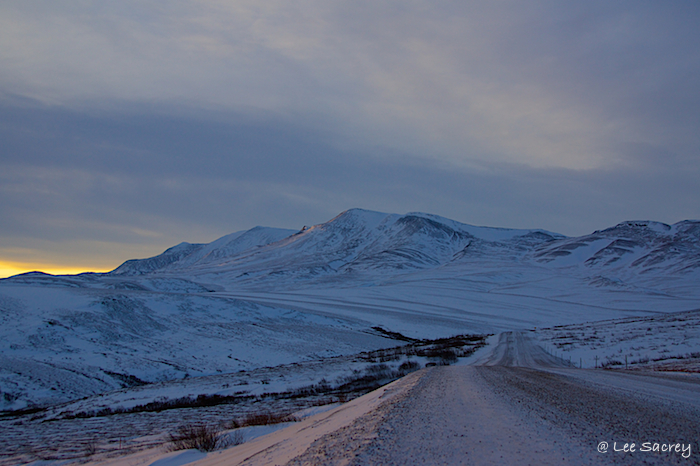 It was a great day and I know now that I have to drive the entire Dempster Highway in summer or early fall, it was amazing. 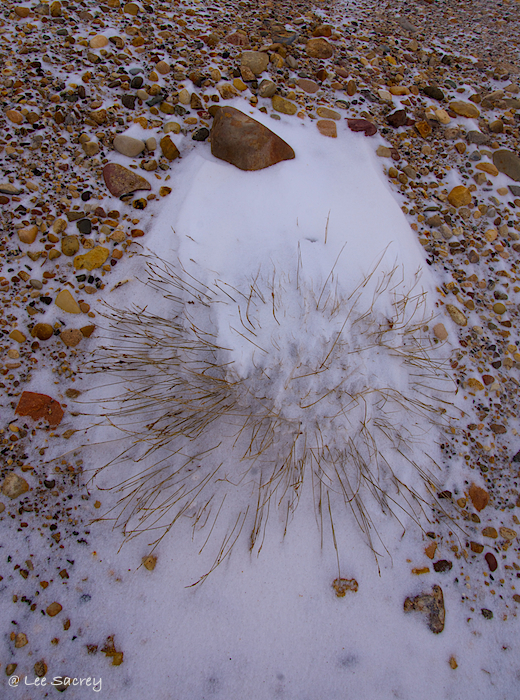 Here are some images I created during that day of driving. 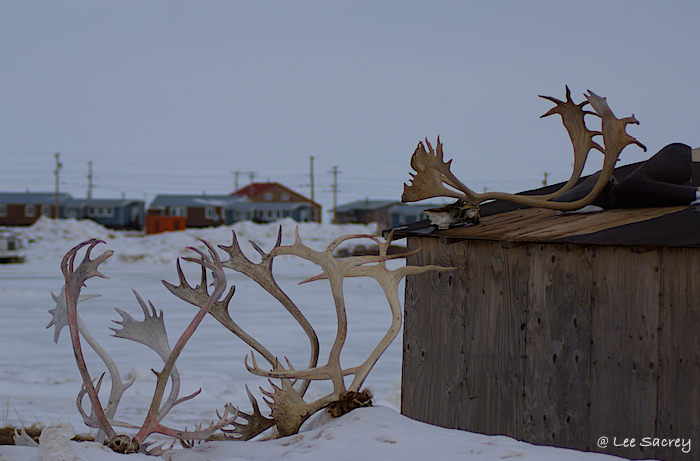 Thanks for stopping in, enjoy the images and for those of you looking for part two of the Caribou, don’t worry it is coming as is part two of Driving the Dempster. Thanks again and as always Happy Shooting.